Greg Mankiw's Blog: The Monetary Base is exploding. So what? An article in Saturday's Wall Street Journal says that some big-league investors are betting that inflation will rise significantly. The reason? "The nation's exploding monetary base is a harbinger of inflation." Is this right? Probably not. 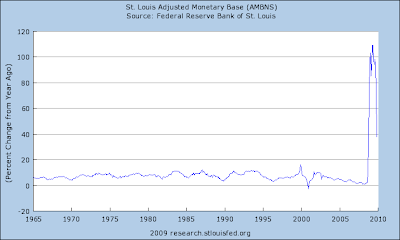 It is true that the monetary base is exploding. See the above graph. Normally, such surge in the monetary base would be inflationary. The textbook story is that an increase in the monetary base will increase bank lending, which will increase the broad monetary aggregates such as M2, which in the long run leads to inflation. That is not happening right now, however. The broader monetary aggregates are not surging. Much of the base is instead being held as excess reserves. But, you might ask, won't the inflationary logic eventually take hold as the economy recovers and banks start lending more freely? Not necessarily. Recall that the Fed now pays interest on reserves. As long as the interest rate on reserves is high enough, banks should be happy to hold onto those excess reserves. That should prevent a surge in the monetary base from being inflationary. Here is one way to think about it. The standard way of reducing the monetary base is open market operations. The Fed sells Treasury bills, say, and drains reserves from the banking system, reducing the monetary base. But consider what this means in the monetary current regime. An open market operation merely removes interest-paying reserves from a bank's balance sheet and replaces them with interest-paying T-bills. What difference does it make? None at all. Both reserves and T-bills are interest-paying obligations of the Federal government (including the Federal Reserve). They are essentially perfect substitutes. The monetary base, however, includes one of them but not the other, largely for historical reasons. The bottom line is that when reserves pay interest, the monetary base is a pretty uninteresting economic statistic. Does this mean that investors should stop worrying about inflation? No. Yet the worry should stem not from the monetary base but from the political economy and difficult tradeoffs facing monetary policymakers. As the economy recovers, interest rates will likely need to rise. Will the Bernanke Fed, feeling the political heat, get behind the curve and allow inflation to take off? Will it decide that a little bit of inflation is not so bad compared with the alternative of risking an anemic recovery, a double dip recession, or (gasp!) congressional action to reduce Fed independence? Maybe. This is, I think, the right way to argue that higher future inflation is a plausible outcome. I don't know whether such inflation worries are justified. But I am pretty sure that the exploding monetary base is not, by itself, a reason to fear a coming surge in inflation.